A public hearing about Duke Energy’s request to extend a deadline to close the coal ash impoundments at its Sutton plant lasted less than 15 minutes, and just four people attended. And now it’s possible that cleanup work at the Sutton plant will be conducted during yet another hurricane season. Citing unexpected weather and permitting delays, Duke asked the NC Department of Environmental Quality to grant a variance to the original closure plan for Sutton. The utility had agreed to remove millions of tons of coal ash from unlined impoundments, shipping about 2 million tons to the Brickhaven mine in Chatham County, with the rest being deposited in a new lined landfill onsite. The current deadline is August 2019; Duke Energy has asked for an extra six months, to February 2020. 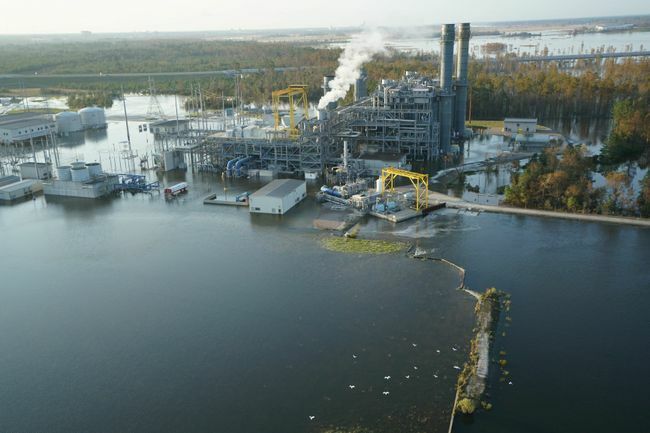 DEQ has countered with a different proposal of a three-to-six month extension, which at the earliest would set a deadline of November 2019, still after the height of hurricane season. In its letter to DEQ, Duke Energy said it was on track to meet the deadline until April 2016. That’s when the state announced a new policy at a town hall meeting sponsored by the NC Advisory Committee of the US Commission on Civil Rights. DEQ declared that it would go “beyond state and federal requirements” by conducting an environmental justice review of each coal ash landfill, the letter read. The EPA’s Office of Civil Rights, the civil rights commission and the state advisory committee would have to review and approve that analysis before further permits could be issued. That review resulted in a six-month delay, Duke said, which was compounded later in 2016 when Hurricane Matthew hit in October. Other buffer requirements, the unexpected discovery of old cypress stumps in the ash basins — which slowed the dredging process — and Hurricane Florence all set the project back, Duke said. While most of these delays are understandable, the extension deadline could potentially expose the remaining ash to severe storms and hurricanes next summer and fall. During Hurricane Florence, coal ash was released from a landfill under construction. There is a disagreement between environmental watchdogs and the utility about whether that harmed water quality in Sutton Lake. There is still time to comment on Duke’s request. Written comments on the request for variance can be sent to the attention of Ellen Lorscheider, 1646 Mail Service Center, Raleigh, N C 27699-1646. Comments may also be submitted by email to publiccomments@ncdenr.gov. Please include the term “Sutton Variance Request” in the email’s subject line. The deadline for submitting comments is Feb. 4, 2019.